Intel holds a Dog & Pony Show for some hand picked journalists it feels will be "Intel friendly" as a result of getting the "scoop" over the mainstream PC media on Intel products as far as three years off. Then Intel proceeds to provide prototype CPUs for testing months if not years before they will actually be available. What a manipulation of the media and public opinion. This is damage control in action folks. Intel is desperate to save face and as many customers as it can while it hopelessly tries to deliver some competitive product in a year or two. The problem is AMD is so far ahead in technology, they can just release better CPUs any time they desire and Intel has nothing to counter AMD's superior products. Even the Intel fanboys and "media friendly journalists" have had to admit that purchasing an Intel product now or in the foreseeable future would be a very poor investment. Bensley. thats a gay name. The chip does nicely though. i hope opteron makes something nicer. i mean, just increase the speed .2ghz on the chip and it will most likely blow it away and still not be power hungry. The cost per month is wrong. The intel chip pulls 479W at 100% load. Actually I think I agree with you. 479W = 479J in 1 Second, 1,724,400J in 1 Hour, 41,385,600J in 1 Day, 1,282,953,600J in 31 Days. The difference is around $8140 for 40-60% load (which is realistic) and around $10,500 ($23,500 compared to around $13,500) for full load. The problem, however, is that the system's power consumption is not the only thing a data center deals with. The more power the system uses, the more heat it throw off. Energy consumption for cooling can match the system's power consumption. Another thing to take into account is the AC-DC and DC-AC power conversion inefficiencies (this is before even hitting the system's power supply, which will lead to even more inefficiency) which will probably add another 20-30% to the real power consumption. So instead of having a difference of $8140 you end up with a difference of $19,536, and that's assuming that you don't need to purchase any new equipment aside from the 40 servers themselves. Another VERY important thing is power density. 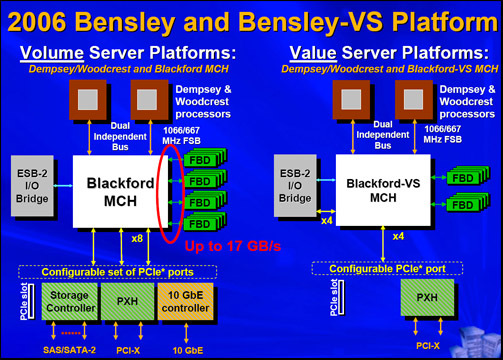 You could conceivably throw 64 1U systems onto a single rack using Opterons, with a ~17KW peak power draw, but 64 1U Benseley systems would require a peak power draw of ~31KW, not to mention that it's probably very stupid to stick 2 Dempseys into a 1U system (but hey, I'd say the same thing about sticking 4 dual-core Opterons onto a 1U system but people still do it).